Steven calls them “potato chips on a bone.” That’s as accurate a description as I’ve heard for these accordion-cut potatoes, delectably crispy on the outside and creamy on the inside with an alluring hint of wood smoke. Invented by a chef at Stockholm’s venerable Hasselbacken restaurant in Sweden (founded in the 1700’s and still in business), hasselback potatoes are one of the trendiest spuds to come down the pike in years. And they only take a few minutes more to prepare than plain baked potatoes. Anyone with modest knife skills can create these starchy works of art. Rub the potato all over with extra virgin olive oil, melted butter, or your favorite fat. Season the outside with coarse salt and fresh coarsely ground black pepper, if desired. Set up your grill for indirect grilling and preheat to 425 degrees. (Don’t worry if you can’t maintain that temperature exactly; just don’t let the temperature go above 450 degrees or the potatoes may scorch.) Brush or scrape the grill grate and oil with vegetable oil. Arrange the potatoes on the grill grate. Throw a handful of soaked, drained wood chips on each mound of coals. Lower the lid. Smoke-roast the potatoes for 45 minutes; the slices should fan slightly. Baste the potatoes with more olive oil or butter, forcing it between the cuts. At this point, you can also tuck bits of cheese in the interstices and sprinkle more on top. Continue to smoke-roast the potatoes until they are tender, the cheese has melted, and the tops are golden brown; 20 to 30 minutes more. Serve with chopped fresh herbs. You can find the full recipe here, which will appear in Steven’s newest book, Project Fire (preorders are now being accepted). In the meantime, here are tips and variations you’ll want to try once you master the simple art of hasselbacking. 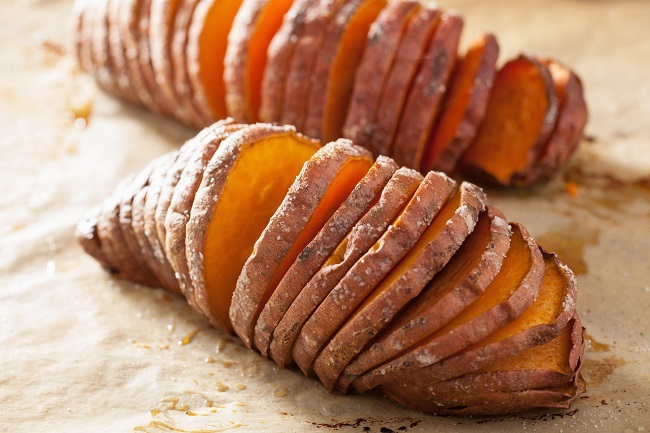 Instead of white potatoes, substitute sweet potatoes or yams. When stuffed with butter, brown sugar, cinnamon, and miniature marshmallows, they make a great Thanksgiving dish. Small B-size potatoes can be hasselbacked and served with a dip and cocktails or as a prelude to an autumnal dinner. Rub the potatoes with duck, goose, or bacon fat before roasting. After oiling or rubbing with fat, season the potatoes with your favorite rub. We’re partial to Steven’s new Project Smoke line of rubs. Try the hasselback preparation on other vegetables. I’ve used zucchini, which was a big hit, but have recently seen the technique used on butternut squash halves. 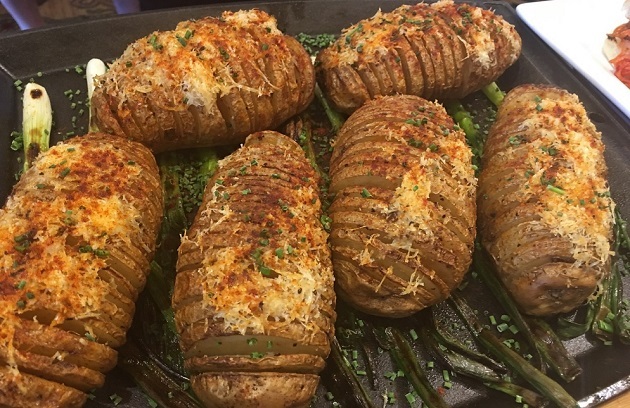 Have you tried hasselback potatoes for yourself? Have another favorite potato preparation? Tell us about it in the comments or on Instagram, Facebook, or Twitter.